This super simple and delicious recipe for Chicken Potato Casserole is perfect to freeze ahead of time, then thaw and bake on nights when you just can't face the kitchen. This recipe is pure comfort food, best served on a cold winter night when sleet is ticking at the windows. You can use any kind of cooked cubed chicken for this recipe; chicken breasts or thighs or drumsticks or leftovers too. This is a great casserole to make after Thanksgiving; just substitute cubed cooked turkey for the chicken. You could also use any type of frozen vegetable. Frozen broccoli and peas would be delicious in this recipe, as would frozen shredded sweet potatoes in place of the regular hash brown potatoes. Serve this hearty and indulgent recipe with a green salad tossed with sliced mushrooms and tiny grape tomatoes, along with a spicy Italian vinaigrette salad dressing. A glass of wine or iced tea completes the meal. 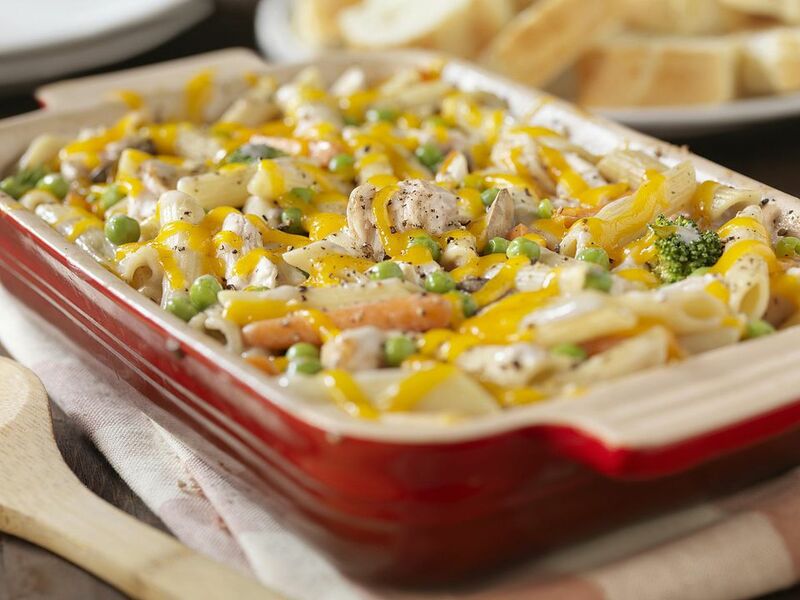 Preheat the oven to 350 degrees F. Spray a 2-quart baking dish with nonstick cooking spray. In a medium bowl, combine the condensed soup, sour cream, milk, chicken and 1-1/2 cups of the Cheddar cheese. Spread three-quarters of this mixture in the prepared dish. Sprinkle the hash browns and peppers and onions over the top of the casserole and press down lightly, then top the vegetables with the remaining soup and chicken mixture. Sprinkle the casserole with the remaining Cheddar cheese and the potato chips. Bake the casserole, uncovered, at 350 degrees F for 50 to 60 minutes or until it's hot and bubbly. Let the casserole stand for 5 to 10 minutes before serving. To freeze, assemble the casserole as directed, except do not thaw the potatoes, peppers, or onions and do not sprinkle with the potato chips. Wrap the casserole in freezer wrap or heavy duty foil and label; then freeze up to 3 months. Reserve the potato chips in the pantry. To thaw and bake, let the casserole thaw overnight in the refrigerator. Uncover and bake at 350 degrees F for 60 to 70 minutes until bubbly. Then top with the crushed potato chips and bake for 5 to 10 minutes longer.